I just got my first taste of fresh raspberries from this season. They were so good. And now, along with my strawberries, I have a fridge full of raspberries! I love this time of year when all kinds of fresh fruits and vegetables are in season. 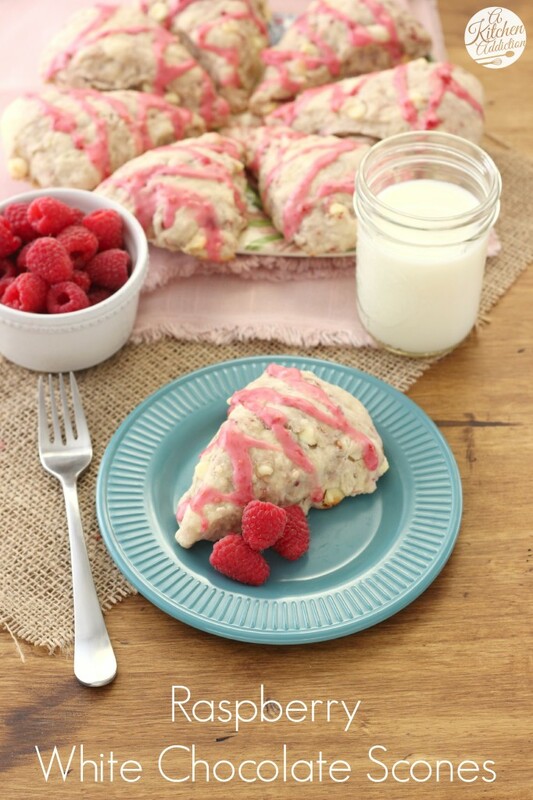 Along with eating them as they are, it’s the perfect time to experiment with new recipes, like these raspberry white chocolate scones! 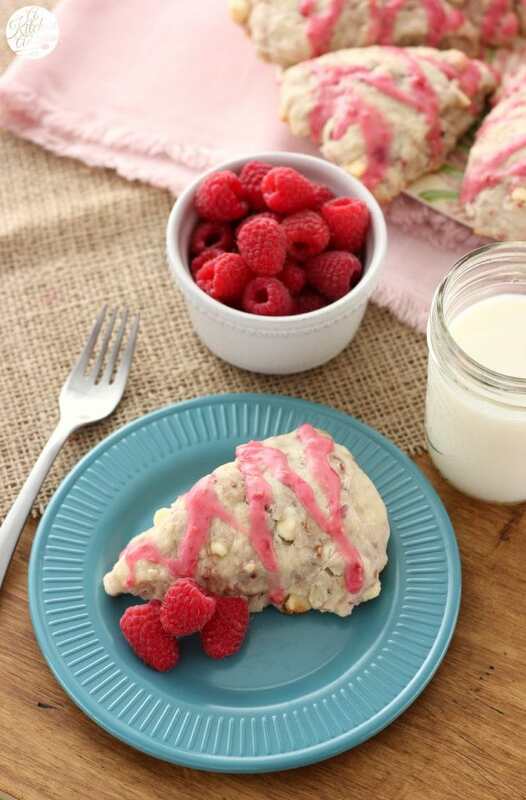 Fresh, sweet raspberries combine with rich, creamy white chocolate to create these irresistible scones. Since raspberries are so delicate to work with, I just mashed them in as I combined them with the rest of the dough. The result was a swirl of raspberry flavor in each bite with bigger chunks of fruit here and there! Since I was out of dark chocolate chips (that is no longer the case, don’t worry! ), I chose to use white chocolate instead of semi-sweet for a richer flavor. That and I had white chocolate raspberry cheesecake on my mind when I was making these scones! To give these scones an extra burst of flavor and sweetness, fresh raspberries are mixed with confectioner’s sugar and top off the scones with a naturally colorful glaze! I love that you love berries as much as I do! Raspberry and white chocolate is one of my favorite combinations! Pinned! I need to get some fresh raspberries ASAP! These look so good! 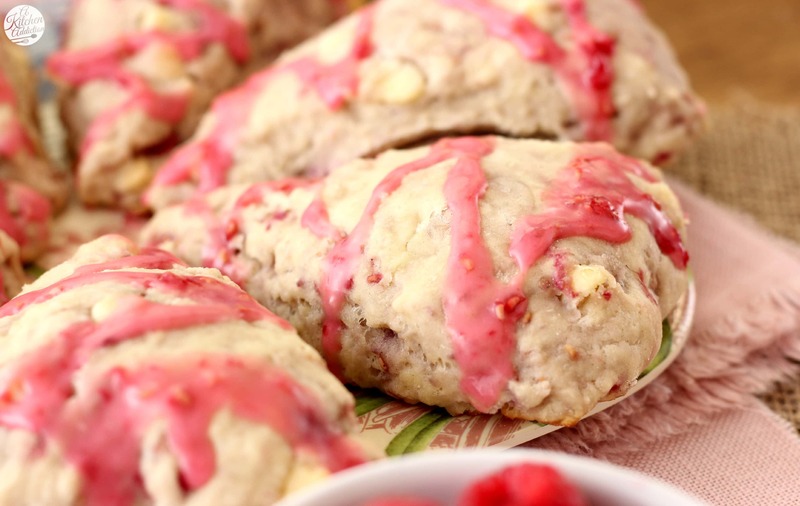 That pink drizzle makes these scones so adorable! Raspberry white chocolate is one of my favorite flavor combinations, so I would love to have one of these with my coffee right now! When are you coming to my house to make me breakfast. All of the scone recipes are making me hungry. These scones sound amazing! Love the combination of flavors, especially the white chocolate. Pinned! I just adore the combination of raspberry and white chocolate! And in buttery scones?? Yum! I swear half my grocery expenses this week were berries. I love this time of year. These scones look delicious. Perfect for breakfast but sweet enough for dessert too. I love scones! I could eat these everyday. 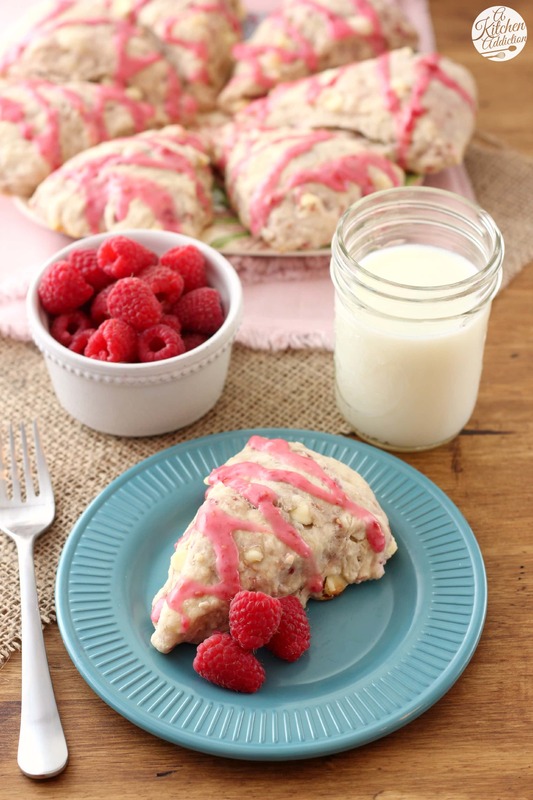 The raspberry white chocolate combo sounds so delicious! I never get tired of scones, and love love love a fridge full of berries! What a pretty pink glaze. This just so happens to be my go-to scone flavor. White choc and raspberry is the perfect balance of tart and sweet chocolate. This recipe surely makes beautiful scones! Reminds me I haven’t made them in a while 😉 Pinned for later, thanks Jessica! 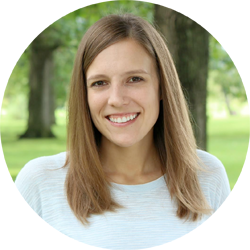 Wanted to try your recipe – just wanted to check on the flour amount – is the measurement for the flour 1 1/2 cups all purpose flour & 1 cup white whole wheat flour, for a total of 2 1/2 cups of flour? Thank you! Yes, 2 1/2 cups total. Sorry for making the wording complicated! I was just trying to say that if you didn’t want to use white whole wheat, you could use more all-purpose. Wow these look utterly delicious 🙂 What a lovely combination! mmm . . . I love this version! Raspberries and white chocolate are perfect together. Super easy and yummy! It was the first time I’ve made scones and they turned out great. We loved the glaze too. Thanks! I’m so glad you liked them! Thanks for letting me know, Emily! I made two batches of these for a potluck and they were quite the hit! Everyone commented how delicious they were. Thanks for sharing this recipe – I will definitely make more in the future. Quick question before making these. I’ve tried many scone recipes and they always seem to be dry. I am wanting a moist version. Are these moist? Yes, the scones are moist. Just make sure to not knead the dough too much and make sure to pull them out when the edges turn golden brown. Hope that helps! I made these and of course put a small tweak into the glaze, I always think long adds so much to any glaze so I added a tsp Lemon Juice to the sugar/raspberry mix… heavenly!! Very good easy scone recipe!